This thing i found, the unit fit perfect. I added some features. Then eventually moved the plasma from it to stacked ofer my synch, free space and moved the little red sp to it, saved a whole parking space. That cart is for a Tectronics 500 series ocilloscope as found during the late 50s through the late 60s. I used to have one with a tectronics 535 oscilloscope on it. Last edited by glen1498; 02-12-2012, 07:54 PM. Here is a shot of the cart I built over the holidays for my new Miller211. This is alot like what I am going to build for my new 211..I love this idea over the oldskool cart every one has...Looks Great! Here are better pics of the cart. small piece with both ends capped and showing the brass freeze plug installed in one end. Built a cart for the dynasty. Did it a little different. I understand why most manufactured carts that have 4 wheels use sheet metal to build them. There is inherent built in flex so all wheels are always on the ground. The bottom frame was buit with 2x2 120 wall tubing that does not flex at all. The back end of the cart that holds the bottle is stiff and stable while the front has some rotation or suspension so all 4 wheels are on the ground, even with a stiff frame. The rest of the frame was built with tubing; 1 5/8, 1 1/4, and 1". The feet of the welder fit into 1 1/4 tube. The bottle holder is 1 5/8 bent half round with a strap holding in the back. Works great. 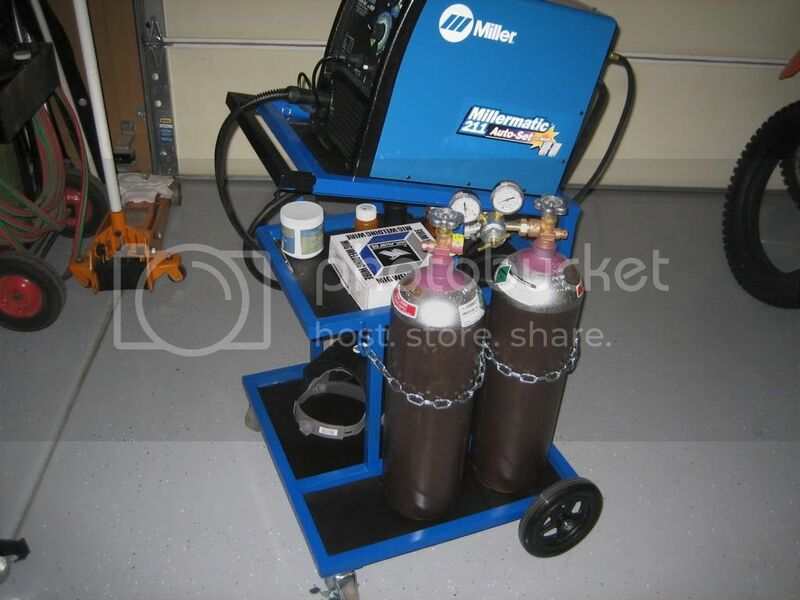 My first project using the MillerMatic 180 Auto-Set: making a portable welding cart. It is easily balanced like a handtruck and navigates over uneven surfaces without a hitch. 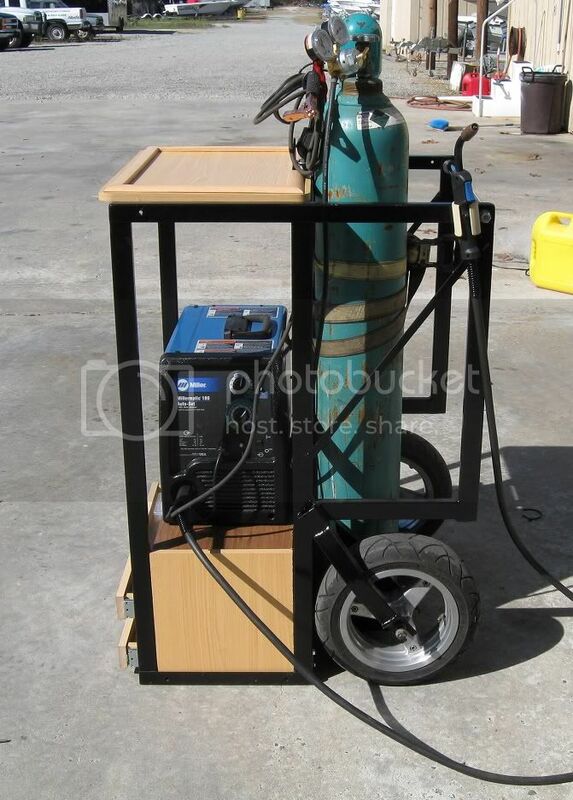 In the second photo, the height clearance of top workspace provides easy access to inside of welder. 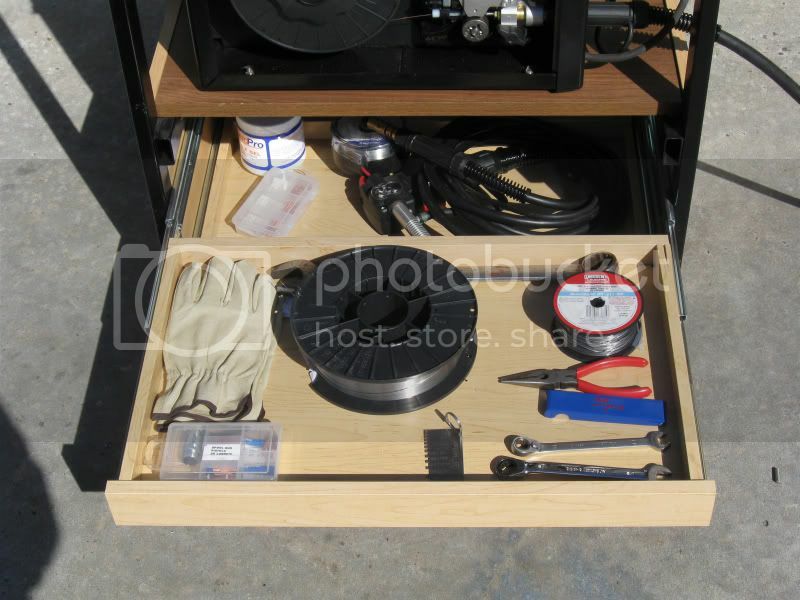 Finally, storage drawers for welding consumables and tools are modified to fit from a manufactured kit. "Necessity is the father of invention." Just finished this cart for my new Dynasty 350 and Coolmate 3.5 cooler. I designed it with 2 sliding tool drawers, one on each side, and 6 filler rod channels. I then had the entire cart coated with Line-X. Lol that's awesome, especially the first one! I took a semester of welding and had so much fun I bought a welder. Here is the 1st thing I made with it. Jeez, I guess I didn't think to much of it when I made up a little cart for my little mm 180 from some scraps I had, I think the only thing I bought were the two front casters. I just wanted a little mobility, since my big Syncro has always been stationary. But I really like some of the more elaborate carts on here with drawers and bins for supplies and accessories. Last edited by Johnp256; 07-14-2012, 11:31 PM. 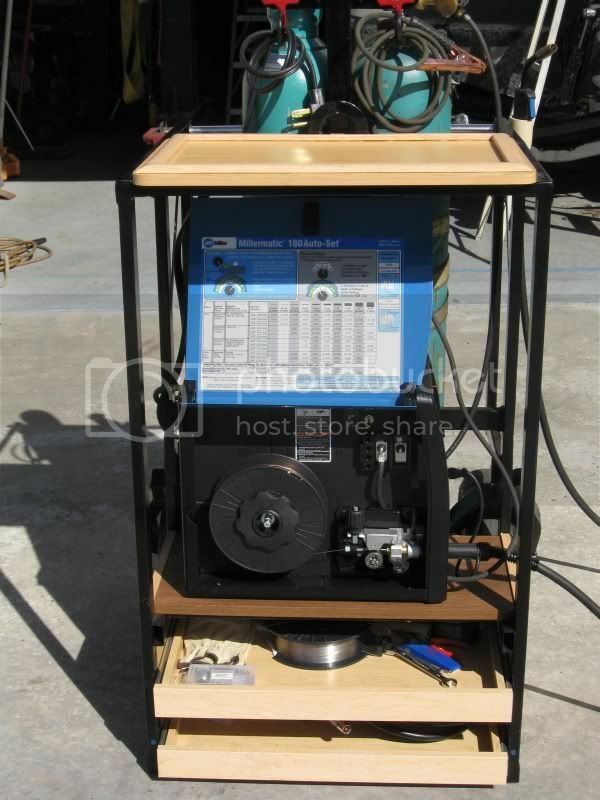 [QUOTE=stan921;289336]I took a semester of welding and had so much fun I bought a welder. Here is the 1st thing I made with it. Impressive first project! The cart looks well thought out, well made and color matched to top it off. Keep doing this quality of work and you should have a very successful fabricating future.